About M DeVries Concrete Inc.
As evidenced by his attention to detail, Mike DeVries thrives on creating the foundation on which your dream home is built. Mike is dedicated to his customers and builders. With over 30 years of experience, M. DeVries Concrete Inc., is the contractor you want to call for your project. Mike began working in this field in 1986. Since then M. DeVries Concrete Inc. was created and Mike has worked hard to build an outstanding and reputable company. M. DeVries Concrete Inc. has been a member of the Hudson Valley Builders Association for over 10 years, Orange County Chamber of Commerce since 2004, and has recently joined the Concrete Foundation Association. Eager to keep abreast of the most recent and innovative technology in the concrete industry, Mike has attended seminars and also many Trade Shows. Our employees are OSHA certified and safety is a priority. 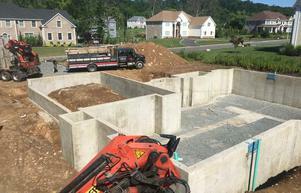 Specializing in residential and commercial poured footings, walls and slabs. Please give Mike a call to discuss your project.